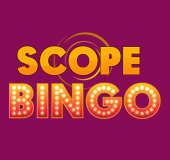 Scope Bingo | Start with a £20 BONUS! We know you love scoping around for all the best bingo destinations, offers and deals in town! Well now you can kick back and relax as Scope Bingo is bringing the best bingo tournaments and awesome deals straight to your doorstep! This brand new bingo site for 2016 is the latest addition to Alderney Gaming Hall of fame, and offers a hot-red and pink-themed site with plenty of bingo, slot and instant game-action! While you scope around the games lounge, you'll be rewarded with a mouthwatering welcome bonus, lip-smacking promotions, and chances to join the VIP programme, win Loyalty Points and scope for big riches! When you enter the realm of Scope Bingo, you'll soon be won over at the reels by an awesome 200% Welcome Bonus after you place your first £10 deposit! This means you'll have at least £20 in your pocket to play with for FREE. You'll also have the chance to spin the famous Wheel of Fortune to win up to a jaw-dropping £2,500! That's not all, as you can also get involved in Dream Team Bingo to win a delectable share of £300 bonus cash, and enjoy four mammoth jackpot games per month where you can win up to a juicy £2,000 reward! You can then takeaway up to £50 in the Friday Night takeaway, high-roll your way up the VIP Scheme, and play extra bingo chat games, tourneys and special promos to earn Loyalty Points! Scope Bingo is home to a classic hit collection online bingo games, so there are a whole host of 90 ball bingo and 75 ball bingo rooms waiting for you, as well as bingo jackpot games! Once you've got your bingo fix, you can also scope around the games lounge to find the hottest selection of slots, instant and jackpot games around like Starburst and Rainbow Riches! You can also meet the other scopian roomies in the chat rooms to play extra games, grab extra bonuses and hunt down big riches that will have you laughing all the way to the bank!